Right off SH2 en route between Auckland and Tauranga/The Mount, the Karangahake Gorge is a very accessible area to explore whether you’re having a holiday in the Coromandel or taking a break during a car journey. The gorge is the site of an old gold mine which began work in the 1870s and there’s lots to see. The process of gold mining is well described on boards as you walk along from the old railway tracks and carts, to the pump house and wheel, to the old tunnels. How much of it you explore might be determined by how long you’ve got and/or how enthusiastic everyone is – it’s an uphill walk from the river but well worth it (not suitable for buggies as narrow and stairs in places). If you do make it to the old mining tunnels, take torches and challenge your kids to find their own seams of precious metals! If it’s warm enough and you’ve got time, you could even promise a swim in the river at the end of your adventure. If you’ve got half a day, you should extend the gold mine tour to include the railway tunnel. It’s goes for over a kilometre and is reasonably well lit, although kids often enjoy having their own torch as well. You can walk through the tunnel and it would be fine for a sturdy buggy but it’s also good cycling as it’s flat and straight. It can be a little slippery if it’s been raining but otherwise an easy ride. The track beyond the rail tunnel goes all the way to Waikino (roughly 7km) following the Ohinemuri River, taking in some bridges and the Victoria Battery (about 700m from Waikino). 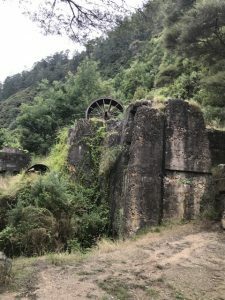 Victoria Battery became one of the largest quartz crushing places in NZ in the early 1900s. Again there are information boards about the process, kilns, tunnels and the old mining tramway to explore. If you’re lucky enough to go on a day when the tramway is working, you can take a ride along the 1.2km route to explore this area or join a volunteer guide on an underground tour of the tunnels. Check here for opening days. Victoria Battery and Waikino can be explored alone for a couple of hours (perhaps taking in the Owharoa Falls as well) as an alternative to the main Karangahake Gorge or this could all be combined, especially if you’re looking to cycle between the 2 areas, to make a fuller day trip. 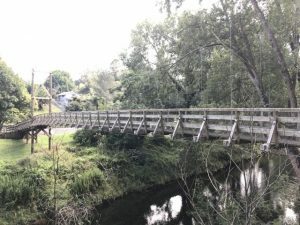 Although there is a cafe at Karaganahake (not always well reviewed, especially slow service) and another at Waikino Station, there are lots of picnic spots if you BYO food. Top Tips: take a bike lock if you’re cycling so you can explore on foot when necessary. For further info on the gold mining industry look at this website. For more info about Victoria Battery, including opening days for the tunnels and tramway rides check out this website. For more info on the walks in the 2 different areas, you can have a look at this website. Address: various access points depending on what you want to explore. For the Karangahake Gorge gold mine park just off SH2 in the car park that’s signposted from the road as per map below. For walking or cycling along the rail trail, try parking off SH2, opposite the Waikino Hotel, cross the bridge and follow the signposts. Or drive down the rail trail via Waitawheta Rd and there’s parking at the end near the Battery.